Kia ora and haere mai, welcome to the first instalment of 9mm for the new year! 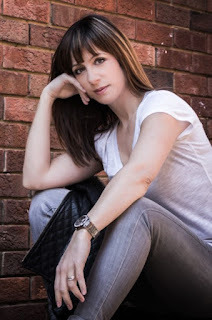 Both myself and this author interview series have been on a little bit of an extended hiatus over the festive season and changing of the calendar, but we're now back on deck and I'm looking forward to an exciting year ahead. I'm very grateful to all the terrific crime writers who've generously given their time to be interviewed for 9mm over the past few years (including a handful that haven't yet been published). It's surreal to think that we're approaching 200 author interviews, for what started as a bit of a lark and side project, in among my magazine and newspaper writing and lots of other things. It's amazing to look back on some of the cool insights various authors have shared about themselves and their crime writing journey. You can see the full index of author interviews here. If you've got a favourite author who hasn't yet featured, leave a comment, and I'll make it happen. Today, I'm very pleased to kickstart our 2018 editions of 9mm by welcoming the remarkable French crime writer Johana Gustawsson to Crime Watch. Born in Marseille, Gustawsson grew up in a bookloving family, and fell in love with mystery writing from an early age. She studied political science then worked as a television journalist and freelancer for French magazines, before moving to London several years ago. Her crime novels are written in French, but primarily set in London and Sweden, her family's current home and her husband's native homeland, respectively. Gustawsson's crime debut, BLOCK 46, was an international bestseller that won both the Balai de la Découverte and Nouvelle Plume d’Argent awards in 2016, and was published in English last year to plenty of acclaim. That book introduces investigative duo Emily Roy (a profiler from the Royal Canadian Mounted Police on loan to Scotland Yard) and Alexis Castells (a French true crime writer), and blends a dark and devious contemporary serial killer tale with elements of Nordic Noir and historic crimes dating back to the horrors of the Buchenwald concentration camp. Roy and Castells return in MÖR, which will be published as KEEPER in English in April. I read an advance copy of that book yesterday, and it's a terrific page-turner, once again blending criminal investigations in London and Sweden with historic crimes - in this case Jack the Ripper. Gustawsson creates a great narrative drive, and delivers a tale that's deliciously twisted, as well as twisting. You can meet Gustawsson at Granite Noir later this month, where she'll appear onstage for the "When Bygones Aren't Bygones" event looking at mysteries hinging on deadly secrets from the past. But for now, Johana Gustawsson becomes the 173rd victim to stare down the barrel of 9mm. It’s Hercule Poirot, the famous Belgian detective created by the Queen of Crime. Not so much for his polished moustache or his egg-shaped head, but for his little grey cells. When they “sing to him” he is definitely my type of hero! It was Agatha Christies’ THE MYSTERIOUS AFFAIR AT STYLES. This is when I met my dear Hercule. I was just seven and I was totally mesmerized! My family is a bunch of psychologists, so when I saw that Poirot was using psychology as a weapon to catch criminals, I suddenly realized how cool my family was! I wrote a biography of a French actress and then I co-wrote a novel with her, which was a big success in France and got adapted into a television series; but most importantly, this is how I met my dear French editor Lilas Seewald or my “Pen Fairy” as I call her, who published my first novel, BLOCK 46. I just gave birth to twin boys, which makes me a mother of three… Entirely my fault, I know, but it means that apart from work and family time, I’ll get lucky if I have time to take a bath… or just finish a sentence when I talk to my husband. But, in seven or eight years time, I suppose I’ll be able to go back to the theatre, raid exhibitions, and travel much more, right? RIGHT? I grew up in Aubagne, in Provence, a city famous for its “santons”, Christmas ornamental figures, and for being the home of Marcel Pagnol, one of the most famous French writers and directors of the first half of the XXth century who used to beautifully, and with a great sense of humour, depict the Provençaux, the inhabitants from Provence. What I would encourage the tourists to do though, it’s to visit during the summer, seat down on the main square, with a Pastis in hand, and enjoy the sun and the cicada singing. If I can dream a bit and be totally unrealistic, I would say: Emily Blunt! When my French publisher sent me my contract, I was in Spain, visiting family with Maximilian, my eighteen months old first-born son, who had decided to stop sleeping at night. I had to read the email twice before understanding it. 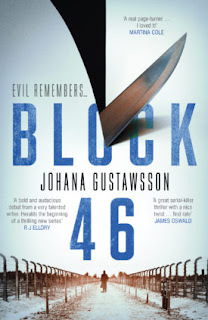 I started jumping like a frog in the living room… and woke up my son who was finally napping… The first time I saw BLOCK 46 'in the flesh”'on a bookseller’s shelf, it was a few months after it was out, as I am living in the UK. I stared at the shelf and I cried which prompted the bookseller to tell me that reading any of these crime novels wouldn’t help me feel better. Thank you Johana! We appreciate you taking the time to chat to Crime Watch. You can read more about Johana Gustawsson and her crime writing at her website, or come along to Granite Noir and meet her in person on Sunday 25 February.